This innovative app vastly improves communication with parents by sending all essential information straight to their phones. Both easy and convenient to use, it has proven extremely popular with parents and schools alike, and thanks to its push notification and newsletter features, it is saving schools “a fortune” in reducing long-term costs. Enhance your user experience and increase engagement with our range of modules. With school modules dedicated to reducing administration time, inspiring learning, increasing parental engagement and improving digital literacy, there are various options available to help you and your school use your school website to its full potential. We Design and Develop Outstanding School Websites, Mobile Apps and Education Software! Since 2003, we’ve been working with thousands of schools across the UK and worldwide to develop the best school websites and online educational software. School Jotter is now the UK’s most popular school website platform, and can be found in thousands of schools globally. It is a complete school web design, hosting and content management system (CMS) with an intuitive and easy-to-use interface. 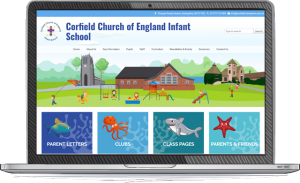 As experts in school websites & e-learning, we have developed School Jotter modules that enable you to manage your website, e-learning and communication tools in one place. Our mobile apps are designed with the custom themes and branding of your school website and are available to all parents for FREE in the App Store and Google Play.